- Cut the pineapple into slices. - Cut brie into pieces that are a bit shorter than the pineapple slices. 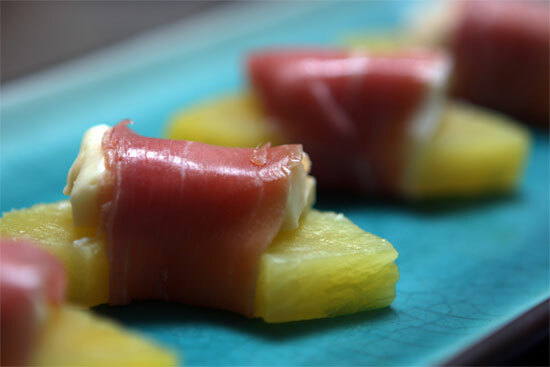 - Center a brie piece on a pineapple slice, and wrap it a layer of prosciutto. - Repeat the above three steps, and try to save some for the guests (don't eat everything while preparing it!). - Place several pieces of the appetizer next to one another. - Serving them on a nice blue plate can add a bit of color to the overall presentation.